Neurons lacking DIP-2 (bottom) have a different shape than normal neurons (top). Courtesy of Nathaniel Noblett and Antonio ColavitaNeurons are among the most long-lived and carefully-shaped cells in the human body, with long axons that send signals to different parts of the body. Unlike other cells that can be replaced when needed, neurons tend to be around for a long time, sometimes over an entire lifetime, and therefore have evolved ways to maintain their complex shapes. New research led by Dr. Antonio Colavita and Dr. Yishi Jin shows for the first time that the mechanisms that keep axons so stable over time may share common features with those that interfere with their ability to regenerate after an injury. 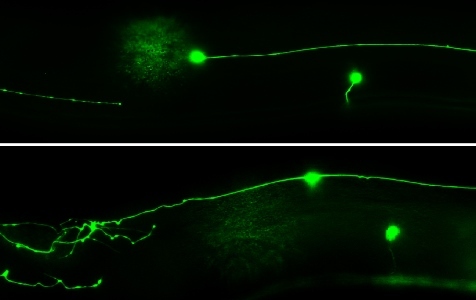 Using the microscopic worm C. elegans, they show that a highly conserved protein called DIP-2 is involved in preventing rogue shape changes, like extra branches, in normal aging neurons and in neurons that have undergone an axon injury. These findings published in the Journal of Cell Biology (JCB) may lead to new ways to promote axon regeneration in neurons damaged by disease or injury.